The Network of sparsely populated areas of southern Europe joins the Platforms that support the Revolt of Emptied Spain, a great social movement that we consider key to face once and for all the great problem of depopulation. The SSPA Network has been working for more than 3 years with the sole objective of national and European administrations facing the demographic challenge that is very serious in some territories, which lose population year after year. As a European lobby, formed by the business organizations and LAGs of Cuenca, Soria and Teruel, we have been reporting with great rigor and pressing in meetings all the administrations and political representatives to face the depopulation in an effective way, trying that once and for all. for all the cohesion funds of the European Union where they are most needed and to generate a strategy that makes it possible to invest them in a correct way to achieve the goal of slowing down and reversing the loss of population. That this social movement was born in Soria and Teruel with its citizen platforms, Teruel Existe and Soria YA !, is something that does not surprise us, because the situation of these provinces that are part of the Network is dramatic in a global way and they need The problem is addressed in an urgent way because they are constantly losing population. The situation in the province of Cuenca is similar, but they do not have strong citizen platforms and with a route to face this mobilization, even so, there are several citizen entities there that support it. We consider that the Revolt of Emptied Spain as a great social movement is fundamental to complement this work of pressure that has been taking place for years, to sensitize consciences and propose solutions, and above all so that it gives once for all administrations to see what is urgent and essential to face this imbalance with a State Plan endowed with financing and with an effective and consensual strategy. 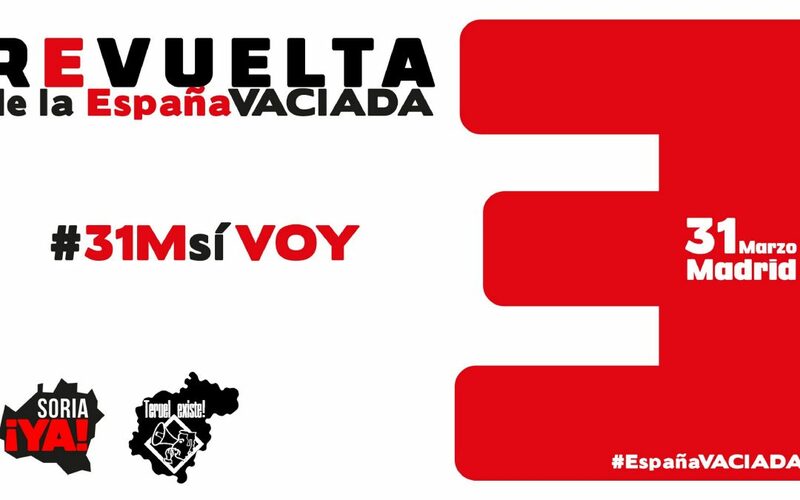 Many of the members of the SSPA Network have joined, they have also sponsored buses, and will be on March 31 at the Madrid’s demonstration, because the future of the provinces considered sparsely populated areas of Europe, having 12.5 inhabitants per kilometer square at the provincial level, is at stake. We hope that the closeness of national, European and regional elections, added to the visualization of the great imbalance and the dramatic situation of many territories, will make depopulation finally one of the main points in the electoral programs of all political formations. We congratulate the citizen platforms Teruel Existe and Soria Ya, and all those who support them, because they are giving an example of union and solidarity, and we share with them all their demands that are concrete and can be assumed by the administrations.